February 17, 2016 - "Press Releases"
East Troy, WI – January 28, 2016 -- Wisconsin Oven Corporation announced the shipment of two (2) natural gas fired ultimate duty walk-in batch ovens to a leading aerospace manufacturer for composite curing of aircrafts. 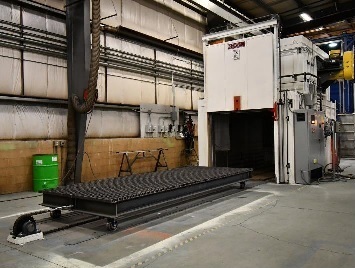 The customer required a compact footprint for the equipment to maximize use of their available floor space. These two batch ovens were designed for side-by-side installation to minimize their footprint and use of facility floor space. The walk-in batch ovens have a maximum operating temperature of 500°F and a work chamber of 10’W x 35’L x 10’H. The composite curing ovens feature guaranteed temperature uniformity of +/-5°F at 120°F and 210°F which was verified through a nine (9) point profile test prior to shipment. The recirculation systems utilize combination airflow which provides both horizontal and vertical upward airflow to maximize heating rates and temperature uniformity of the product. The batch ovens are equipped with two (2) 20,000 CFM @ 15 HP belt-driven blowers. Supply air is delivered through fully adjustable boxed ducts and side-mounted along the length on each side of the work chambers.